Spartan Maximizing Access to Research Careers - Undergraduate Student Training for Academic Research (MARC U STAR) program. As a first-generation college student, Guillermo Moreno says he soaks up any information he can get about the college experience and where it can take him. Moreno is pursuing his bachelor’s degree in human biology from the College of Natural Science and has been conducting research with faculty—from entomology and genetics to pharmacology and now, neuroscience. He is also on a pathway to his doctorate as part of the Spartan Maximizing Access to Research Careers – Undergraduate Student Training for Academic Research (MARC U STAR) program. Modeled after the Honors College’s Professorial Assistantship (PA) program, four students are paired with faculty mentors to conduct research and learn first-hand how to prepare for graduate school and beyond. Michigan State University is in the first year of a three-year grant for the program from the National Institute for General Medical Sciences, which is a division of the National Institutes of Health. The grant supports undergraduate students who are underrepresented in the biomedical sciences to improve their preparation for high-caliber graduate training at the PhD level. Moreno and his counterparts receive funding to cover tuition and fees, along with a stipend, but the professional development aspect of the program has meant the most, the students say. Dajashinair Howard, who is studying chemistry in the College of Natural Science, said the program strengthened her interest in research and made her more knowledgeable about graduate school. Along with College of Natural Science human biology major Kelly Montgomery, the first cohort of MARC students have met one-on-one with faculty mentors, attended seminars, and realized they’re part of a broader scholarly community. The group traveled to Nashville, Tennessee, for the annual Biomedical Research Conference for Minority Students. 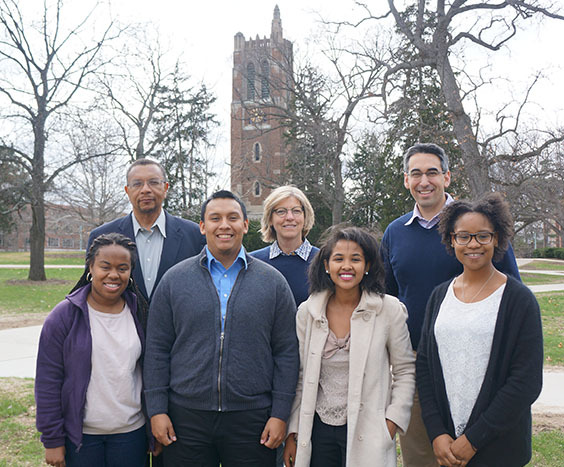 Because the program requires students to work with faculty at universities other than MSU, two of the students worked on research at the University of Michigan, while the other two headed to the University of Illinois-Chicago. Jerry Caldwell, director of the Charles Drew Science Scholars program, is one of the leaders for the MARC program and says there was somewhat of a learning curve to recruit and get the students placed with the right faculty mentor. But since last year, the program has truly built a community of students with similar goals. All of the students are preparing to take the entrance exam for graduate school as they will earn their diplomas in 2015; Caldwell and his colleagues, Justin Micomonaco and principal investigator Cheryl Sisk, are already planning for the second cohort. This pipeline will “give students the ability to rally around each other,” said Micomonaco, director of assessment and research for the Honors College.